16 :: Gerrards Cross Golf Club is considered one of the most attractive courses in South Buckinghamshire. The green of our signature hole is set in a tree enshrouded bowl well below the tee. The green is heavily bunkered and a steep slope down to woodlands on the left can leave a fiendish recovery. 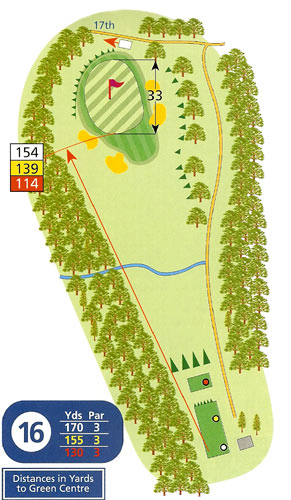 The green is generously deep but there is little margin for error on this hole.